This political party’s influence in Milwaukee, first apparent in the late 1830s, was circumscribed because of the city’s substantial foreign-born population. German and Irish voters tended to align themselves with the Democratic Party against the Yankee-dominated Whigs, who were seen as nativists and temperance advocates. 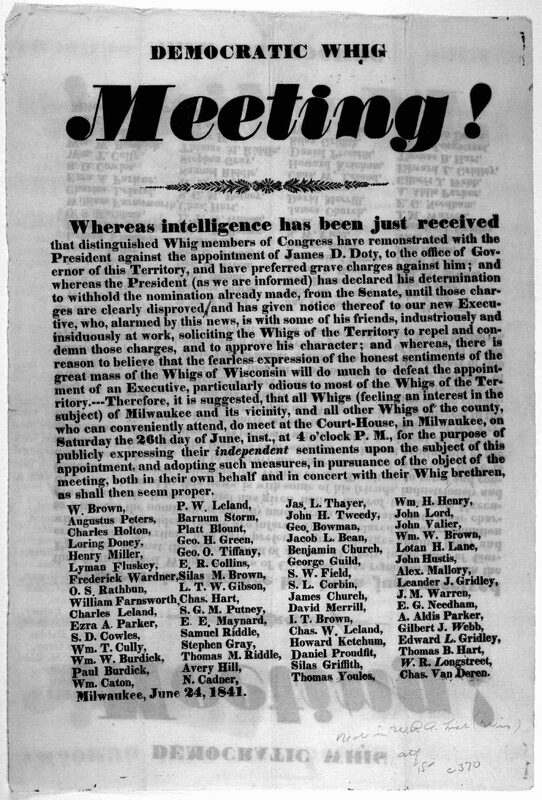 Over the course of the 1840s and 1850s, Milwaukee Whigs attempted to form coalitions with other groups, including abolitionists and the Free Soil Party but they failed to make a significant impact within the local electorate. When the Republican Party emerged in national politics, it attracted most of the remaining Whigs. Watrous, Jerome. Memoirs of Milwaukee County, vol. 1. Madison, WI: Western Historical Association, 1909.